This might be my most favorite thing I’ve ever made. Not joking. I had made some candied ginger during the holidays and as a result, had a beautiful dark, rich syrup sitting in the fridge with no future purpose or prospects. I figured we would one day craft some delicious ginger-y cocktail. Well, we haven’t quite embarked on that experiment, but I’ve definitely found a use until then. It only makes sense that this meal was the product of Valentine’s Day. The day we collectively celebrate love. And while food can never replace love, it is often used as a form of love. I certainly enjoy showing my love for people by feeding them, including my love for myself! Food made with love is the best kind. Which is why this recipe is going in the hall of fame. Give it a try sometime this week! Place sugar, water, and a pinch of salt in a saucepan and bring to just boiling until sugar is dissolved. Add ginger and reduce to simmer (uncovered). Remove from heat when liquid has become thick, about 30-40 mins. Let stand for an hour and then strain syrup into a jar to use for the pancakes. Drain ginger on a rack. Once dry and cool, place in a bag with some granulated sugar to coat. Set aside for a snack, cocktails, or other use. Heat oil is a skillet until pretty hot. Using a 1/4 c. scoop, pour batter into the skillet and fry one side until surface begins to bubble and edges start to puff. Flip and cook the rest of the way. 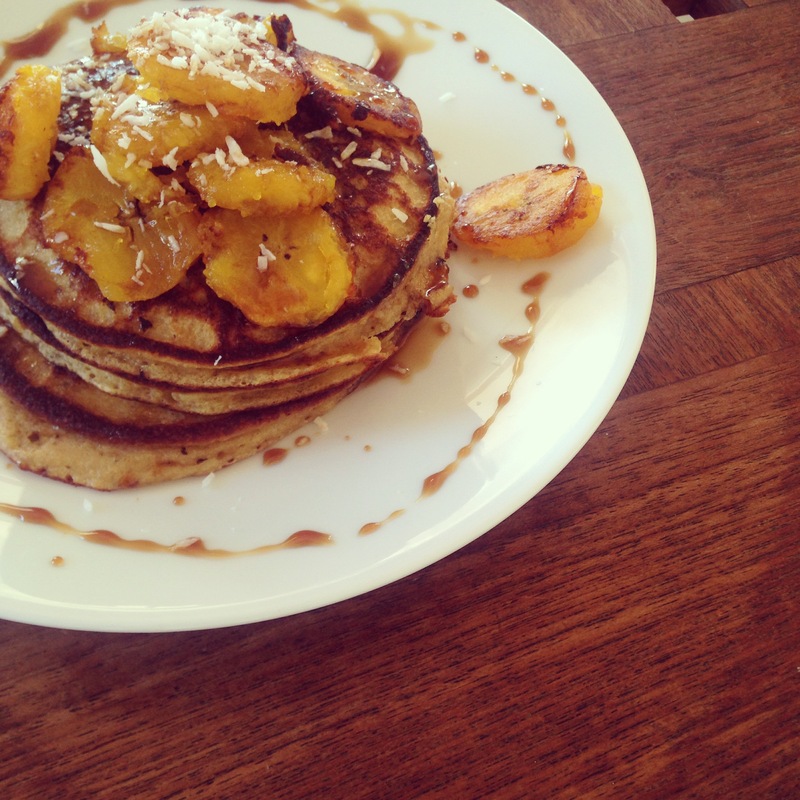 Serve and top with coconut, fried plantains, and a large drizzle of ginger syrup.